Every January for the last few years, I have posted the same poll. I’ve asked readers to tell me what they want to see on Paper Thin Personas. I usually make a list of a few different things I think I’d like to do and I let people tell me what they want. This time things are going to be a little different. This time I’m asking for a tiny bit more involvement. If you want to vote in the usual annual poll, it’s over on the sidebar and will be there for the next two weeks and I encourage everyone to do it. I really do pay attention to the results. Heck, that’s how the Poppets and the Pucks and my poorly drawn male companion to Marisole happened (he’s getting a reboot… someday). If you answer one of my questions (either here or through email) then you will be entered in the drawing. If you won a contest last year, it’s a new year, so you can still win this one. The drawing/contest is going to be open until Wednesday the 15th of January. 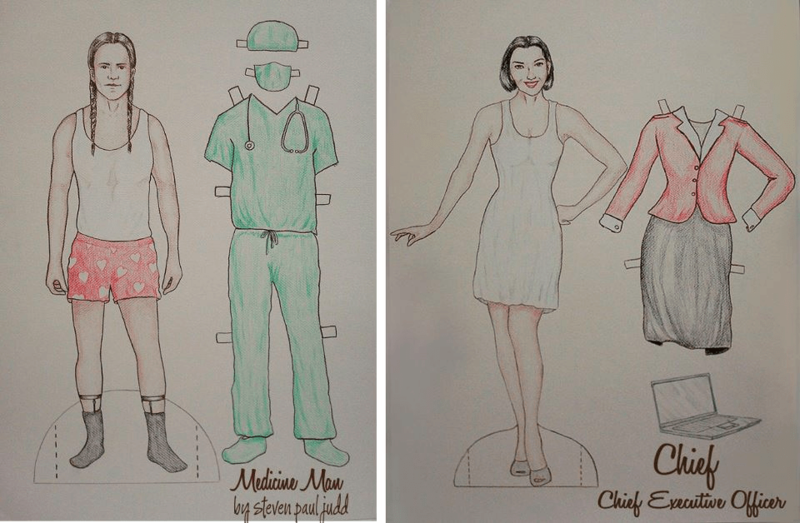 Otherwise, my usual contest rules apply (see the FAQ) and the prize is a custom drawn paper doll from any of my series. I will contact the winner via the email entered in the comment form, so make sure that email actually works. If I don’t hear from my winners in a week after the email is sent, I’ll draw another name. By the way, this is my 499th post. Next one is going to be 500. Maybe I’ll do something special. Okay, so after I posted Riven, a few people asked to see more of my childhood work. Today, therefore, I offer Ellie. When I look at Ellie, I see a lot of how far I’ve come and also how far I still need to go. I still don’t feel like I know how to draw very well, but I like drawing and, as I always say, gusto makes up for a lack of skill sometimes. 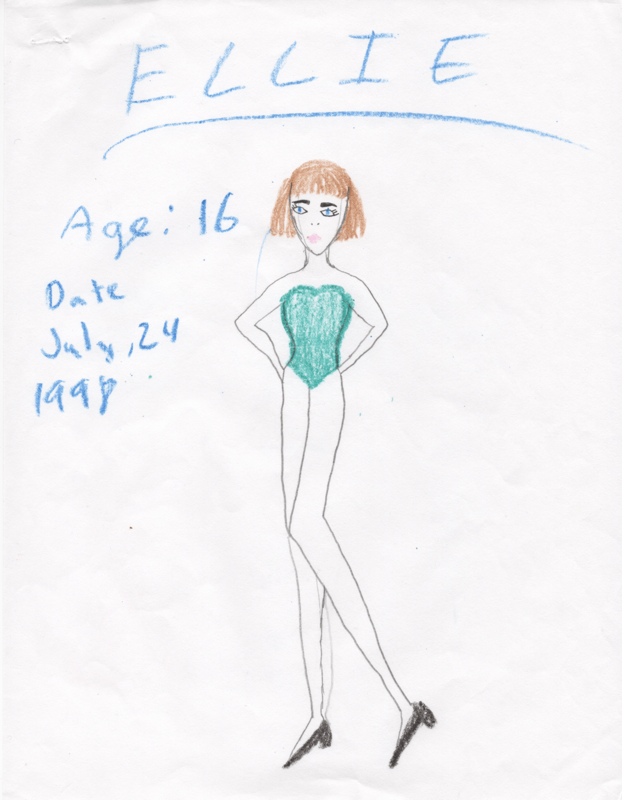 Anyway… here’s Ellie, a paper doll of my childhood (and also of the midriff bearing days of the 90s). I drew Ellie 15 years ago. I was in middle school and I remember being quite proud of her. I distinctly recall carefully drawing her clothing. Clearly, it was the 90s and I was clearly used to working in Crayon. I worked in crayon for a lot of my childhood drawings. I was convinced it was better than colored pencils. In hindsight, I wish I’d learned to use colored pencils or markers earlier on, because those skills would be useful now that I’m older. Never the less… this is Ellie… She’s still pretty cute. By the way, I just realized we’re mid-Kwanzaa here in the United States (I don’t know if it’s celebrated outside the US…), so I’d like to wish a Happy Kwanzaa to anyone who is celebrating. I think I’ve mentioned already that Paper Thin Personas is turning three in January and entering it’s fourth year of life. It’s been three years since the site crashed and I had to start over from scratch. I couldn’t be more pleased with where the blog is now. Marisole Monday went to space as an alien in color and to be colored. I remember being conflicted about posting the ray guns. There’d been some gun violence around the time I was working on this paper doll set. People were talking about the dangers of toy guns and children. I didn’t get a single complaint about my ray guns. This paper doll has the dubious honor of being the paper doll set that I spent way to much time on the shading, only to realize I’d done it on the wrong side and having to correct it all on photoshop. I loved the outfit on the right so much that I thought it was worth it. 🙂 Actually, I love both these outfits. I got a request for some superhero Puck paper dolls. I confess openly that I wasn’t totally pleased with how the two of them seemed while I was drawing them, but I wanted to draw some male paper dolls aimed at boys and I thought for sure that boys would be into these options. In the end, I was quite pleased how they came out. Last year, I was contacted by some people from HP about using my content in a downloadable application for their web enabled printers. After many months of conversation and discussion, I’m excited to announce the Paper Thin Personas App for HP Web Enabled Printers featuring Marisole Monday. Once the app is installed, a Marisole Monday paper doll will be printed automatically from your web enabled HP printer every Monday in black and white or in full color (you choose when you set up the app). I’d probably get them in black and white if I had kids, because than the paper dolls become a fun coloring activity. And who doesn’t like fun coloring activities? A few things you should know… You need a web enabled HP printer to print out the Marisole Monday paper dolls. All of the paper dolls in the App have appeared on the blog in full color before, but not all of them have appeared in black and white. I think the Paper Thin Personas App is great for parents or grandparents who want something for their kids or grandkids to play with every Monday or if you just want a Monday morning pick me up. It’s really very fun to walk into the room on a blurry-eyed Monday morning and see a paper doll waiting. Download the Paper Thin Personas App for HP Wed Enabled Printers Here and have a great holiday season. Organizing Blog Posts… Calendars and You! The blog calendar. I never said it was attractive. I talked about my Red Binder a little while ago. I love my Red Binder, but I wanted to write about the other tool I use for organizing blog posts. I use Calendar Labs to create my monthly calendars. I like Calendar Labs, because you can choose which day to start your weeks on. Since Marisole and Friends Paper Dolls always post on Mondays, I can choose to start my weeks on Monday, rather than Sunday. I find it’s easier to plan if I do it that way. As you can see from the photo, the Calendar gets filled in as I figure out what is going to go up each week. I took this photo mid-November when I was still figuring out what the month was going to look like. These posts often change and move, but my general goal is to have two printable paper doll posts and one non-paper doll post each week. At the bottom of the calendar, I keep a list of what posts I think I am going to have completed in time to post them in any given month. Since I work in spurts to activity, its possible that I might have four or five pages of paper dolls ready to go up. Now, I could post these all in a row… which would be great for five days. The problem is that the next five days there would be nothing. In Blogging, consistency is just as important as frequency. So, while I might want to show off what I’ve done from a long Saturday afternoon spent working on blog things, I know the smart thing to do is to space out the posts and the calendar helps me to do this. It also gives me breathing room and space and makes sure that I know I’m going to have something up each week. It allows me to plan vacations or busy times of my life without having to worry about the blog. Does it mean I always manage to get up everything I wanted to get up when I wanted to get it up? Nope, often not, but it sure helps me map out each month and it lets me know if I am going to be desperately short. What I hate, more than anything else, is realizing at 8pm on a Saturday night that I don’t have a Marisole Monday & Friends post even drawn for Monday. Can I get it done in a day? Yes, I can, but I won’t have any fun doing it and the product won’t be very good. So, I usually don’t. I need to know ahead of time if I’m out of scanned materials. I think sometimes blogs function under the assumption of spontaneity. There is a tendency to assume that someone just sat down at their computer and produced in a moment a wonderfully written post with great photographs. A great post comes from planning, from knowing what you want to post and then carefully putting it together. It’s a labor of love and it always takes time. Spontaneity is a myth. 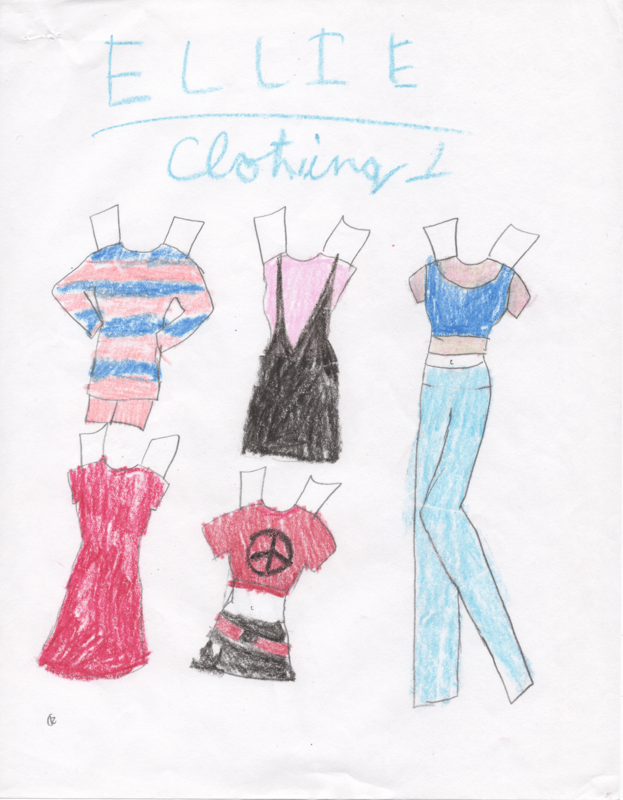 I drew paper dolls when I was a child. And after my apartment flooded, I found myself going through a lot of my childhood drawings checking for mold and water damage. Quite a few things were destroyed, but most of them were safely tucked away in plastic bins, protected from the water. I thought it might be fun to share some of them on the blog, since I often get emails from young people asking how to become better artists. All I can say to that is practice. Practice. Practice. Also, take art classes when you’re in high school and have the time. Now that I’m out of high school, I regret not taking the figure drawing or the advanced water color courses that were offered. So, Tom Tierney was my favorite paper doll artist when I was a child and I admired his figures. This was my attempt at copying that style. She’s holding a brush, rather awkwardly, and brushing out her hair to cover her breasts modestly. She has a streak of silver in her hair, but I don’t think it scanned that well. My first ever Tom Tierney paper doll was Christopher Columbus, bought for me by my sister when I was eight or nine, I think. She suggested that I not cut it out and I never have. It’s still sitting in my collection somewhere. I remember it had historical information about Columbus in it. I read all of that and then pestered by teacher about why we celebrated Columbus Day when Christopher Columbus was such a jerk. I still have serious issues with Columbus Day, but that’s a whole different story. November is Native American Heritage Month, so let us take a moment to consider the world of Native American paper dolls. You can see more of Steven Paul Judd’s work from Indian Country Daily, his Etsy site and this nice summary from Southwest Indian Arts. But I didn’t choose Judd’s work just because I think it’s amazing (though I do), I chose it because I believe it reveals something important about how paper dolls depict Native Americans. Humans create societies and in these societies the dominate social groups use their position to create culturally constructed ideals which than are presented as self-evident and natural. One term for this process is “hegemony” (often used in a political science context) another term is “social construction” (often used in a psychological context), but most fields that deal with human societies have a term they use to illustrate this idea. But what, you might be wondering, does this have to do with paper dolls? 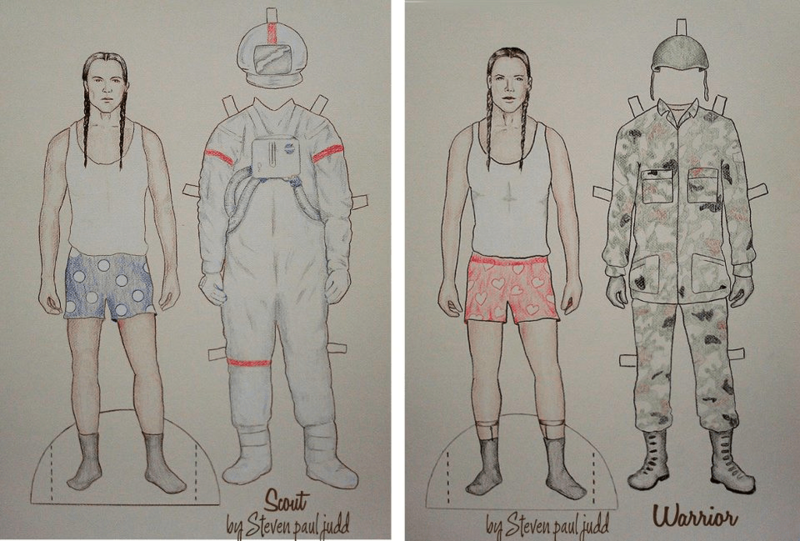 Paper dolls are not mere playthings, rather paper dolls illustrate for how people look and who people are. When Native American paper dolls depict only traditional dress, the illustrations send a message about how and what Native American’s are as a people (or, more accurately, as hundreds of different groups of people). Not to say that there’s anything inherently wrong with depicting accurate, tribally specific, traditional dress in paper doll form, but when these paper doll sets don’t also include contemporary clothing, they create the illusion that Native peoples only dress in regalia or, more dangerously, exist only in the past. The obsession with traditional dress harkens back to the 19th century obsession with “documenting a culture on the edge of extinction,” a dangerous false idea. When Native American children only see themselves presented in these limited contexts, they are denied the opportunity to be equals to others in society. When non-Native children see only traditional dress on Native American paper dolls, they are denied the opportunity to see similarities rather than differences, are taught that Native peoples all dress in traditional dress all the time and are presented an image of a “costume” rather than a person. Do I think that all Native American paper dolls in traditional dress are bad? Of course not, but paper dolls should open up imaginary worlds, not limit them. I shall now step off my soap box and welcome anyone else to express their views, politely of course, in the comments section.